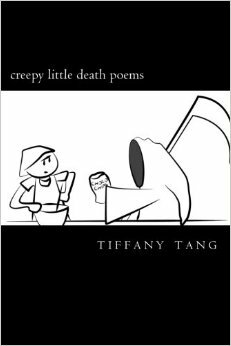 …introducing ‘creepy little death poems,’ the book! Because the response to this blog post was so positive, I decided to take advantage of National Poetry Month in April of 2013 to post 30 days of “creepy little death poems” on Facebook – mostly on a dare. What followed was a month of humor and darkness that got everyone around me giggling. Well, most everyone. My mother was worried about me. Peripheral Facebook connections were either hesitant about commenting on my page or over the moon about the poems. But mostly, people really dug them. I was happy. I dug them, too. Early in 2014, I was cast in a production of “Macbeth” at Intrepid Shakespeare Company, where I was handed a challenge: find an illustrator, create a book and we will sell your ‘death poems’ in the lobby. I found a ‘death poem’ kindred spirit in Lizzie Silverman’s clever artwork and together we created this compilation. I can’t tell you how much it means to me that people want to have this on their bookshelves. What started as a very awkward step towards uncovering the darkness has turned into thousands of points of light and I am grateful to have people around me who say they believe – in me, in the amazingness of creating work, and in the idea that when we support each other’s artistic pursuits, we all benefit. Grab a copy of “creepy little death poems” here.